Nutrient cycles look at how important molecules in an ecosystem are transferred. Like energy, these nutrients are never lost from the cycle, merely stored in a different form - be it fossil fuels, living organisms or CO2. A very important role played by microorganisms is that they feed on dead material by saprotrophic nutrition, and convert complex organic molecules to simple ones. All life is based on carbon; it is contained in proteins, carbohydrates; indeed all organic molecules contain carbon. The carbon cycle involves several stages of carbon being: fixed (incorporated as part of) by plants from the atmosphere. This carbon is transfered to consumers by eating, or becomes fossil fuel in fossilisation. Below is an example of a carbon cycle, they can be represented a number of ways, and this is just one example. Although much is said about rising carbon dioxide in the atmosphere, only 0.04% of air is CO2, indeed most is in the ocean as hydrogen carbonate (HCO3-), and this is where most photosynthesis occurs. There are two steps which are mentioned more than once; these are: respiration, all organisms do this and it converts carbohydrate to carbon dioxide. 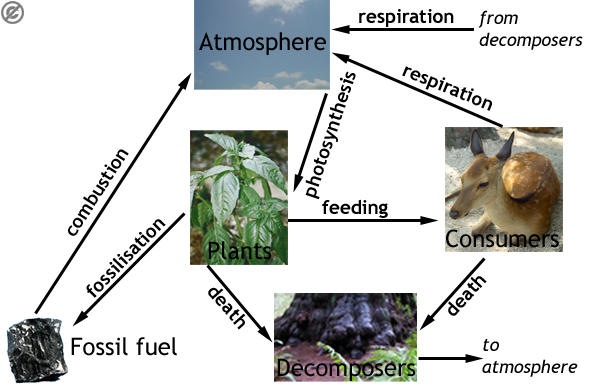 And death and decay; when organisms die, their nutrients are recycled by decomposers. Nitrogen is also a very important compound for an ecosystem. Despite its abundance in the atmosphere (79% of air is nitrogen), it is often in very limited supply. This is because it is required by plants as ammonium (NH4+ or nitrate (NO3-). After carbon, nitrogen is the most important atom in organic compounds. It is particularly important in nucleic acids, and amino acids, which make up proteins. 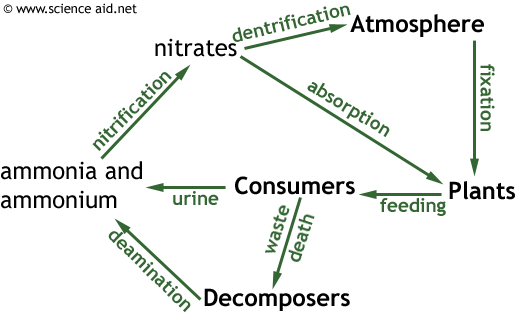 Below is an example of the nitrogen cycle, it is more complicated than the carbon cycle. Dentrification Dentrifying bacteria. This is the loss of nitrogen in to the atmosphere: NO3- → N2. Detrifying bacteria are anaerobes so tend to live in oxygen starved areas, such as waterlogged soil and stagnant water.